At the Our Ocean Conference, I had five minutes to tell an international audience why ocean acidification is a problem for people around the world. With my blog series this summer, we’re going to explore this further. I will share the stories of the people I met last year; stories that taught me how ocean acidification could threaten economies and cultures; stories that taught me the crucial need for increased monitoring, research and technology; and stories that taught me how all of us have a role to play in addressing ocean acidification. Let’s start with the threat to economies. Just how important are the resources threatened by ocean acidification? To answer this, I want to tell you about two places that are very special to me: Sechura, in Northern Peru, and Aitutaki, in the Cook Islands. First, I will tell you about the scallop farming region of Sechura, and in my next post the tropical paradise of Aitutaki. We know that ocean acidification threatens animals that build their shells from calcium carbonate, like oysters and scallops. We have seen the impact of ocean acidification on oysters in the Pacific Northwest, and a Canadian scallop farmer recently blamed his operation’s losses on ocean acidification. Scallops are grown around the world, and I had the chance to visit a new booming home of the scallop industry: Peru. La Bahía de Sechura, or the Sechura Bay, is the 90 km wide bay that is home to Peru’s scallop farming industry. According to a sign by the road as you drive towards the docks, the bay is the “source of food and life for the world.” After six weeks in Sechura, it became clear to me that this sign was no understatement. In Sechura, scallops don’t simply employ those who collect them from the bay, those hauling sacks of shells on docks, or those shucking and packaging scallops in processing plants. This $70 million export economy is a profound driver of the entire Sechura economy. Since the scallop industry took off in Sechura about ten years ago, an entire hospitality industry has emerged from nothing. There are now hotels and restaurants for business visitors, busses for long-distance commuters, and an informal taxi fleet for thousands of divers and deckhands to travel from the town to the dock forty minutes away. 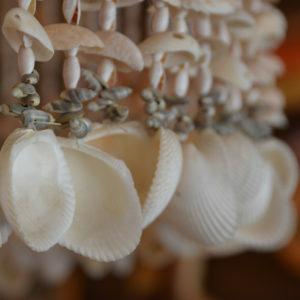 In Manocra, a tourist destination a few hours north of Sechura, artists take the scallop shells and sew them into purses, or elaborate lamps. These emerging industries and jobs, and the opportunities they create, have increased the quality of life in Sechura. Scallops have even improved the sanitation of the region. These hunks of sweet, white meat are extremely valuable in the export market, and extremely vulnerable to contamination from pollution. Thus, the towns surrounding the bay have taken it upon themselves to improve the quality of the water thereby improving the environment for both the scallops and the locals! For example, fishermen have redesigned the toilets on their boats to be self-contained, and the town surrounding the landing dock is building a new sewer system to control spills into the waterway. With so many industries and opportunities supported by scallop farming, a collapse in scallop production due to ocean acidification could cause the entire economy to collapse along with the quality of life. A man selling produce in the market summarized this when he said to me, “Si no hay conchas en Sechura, no hay nada.” If there are no scallops in Sechura, there is nothing. Scallops mean everything to Sechura. Everything. Ocean acidification threatens everything in this corner of northern Peru.